Our January issue features Scouting Trip, an Annette McGivney story about Boy Scouts of America Troop 65 from Wood Dale, Illinois. The Scouts hiked the Grand Canyon in July, and in addition to hiking rim-to-rim-to-rim, they also delivered a $4,500 check for replacing picnic tables at Indian Garden Campground. The Grand Canyon Association, which manages Grand Canyon National Park's fundraising efforts, passed along these photos of Troop 65 presenting the $4,500 check. In addition, a GCA donor offered to match the Scouts' funds, so a total of $9,000 went toward the project. 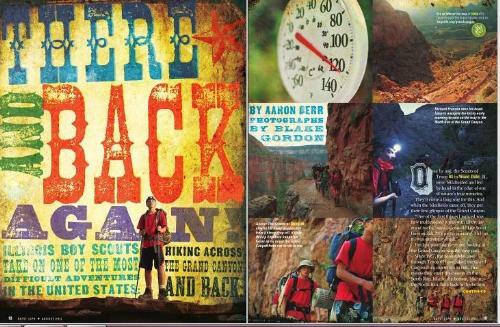 To learn more about the Scouts' hike, pick up our January issue, on newsstands now. Wood Dale Boy Scout Troop 65 member Carlos Mercado (center) of Bensenville ties his boot June 24 before a 10-mile hike to train for an upcoming 50-mile trek at the Grand Canyon. Troop 65 scouts Sam Nearing (from left) and Arthur Kawalkowski of Wood Dale get ready June 24 for a 10-mile hike to train for an upcoming 50-mile hike at the Grand Canyon. Troop 65 scout Peter Wedemann of Wood Dale grabs his gear June 24 for a 10-mile hike to prepare for a 50-mile trek at the Grand Canyon. Troop 65 scout Carlos Mercado of Bensenville prepares June 24 for a 10-mile hike as part of training for a 50-mile trek the troop will make at the Grand Canyon. WOOD DALE – While many kids their age are enjoying lounging by a pool or sleeping in during summer vacation, a dozen Wood Dale Boy Scouts are preparing for what may be one of the toughest weeks of their lives. "The payoff comes at the very end," Troop 65 Scoutmaster Rich Zollner said of the troop's upcoming Grand Canyon hike. The troop and 11 adults who will make the trip with them have been training since October for the 50-mile hike from the south rim of the canyon to the north rim. The scouts hike 10 miles twice a week, and each one has been building up the weight of his pack to one third of his body weight. Occasionally, they make 20-mile hikes on weekends at places like Starved Rock. "You get to the top, and it's the greatest feeling in the world," Zollner said. Troop 65 made its first Grand Canyon hike in 1967 and has returned every four or five years since then. Zollner said this will be his seventh time hiking the canyon with scouts, but his 10th time overall. While the troop has hiked the entire trip on foot except for the first year when they rode mules, the scouts wanted to do something more this time. "We've gone to the canyon so many times that it was time to give back," Zollner said. In addition to physically preparing for the seven-day hike, the scouts are raising money to help replace deteriorating picnic tables at Indian Garden, where hikers can rest during their journey along Bright Angel Trail. The Grand Canyon Association plans to purchase and pay the cost of delivery for 33 heavy-duty, galvanized steel, thermoplastic coated picnic tables. The entire project will cost $35,000, so the scouts asked to help. "You would think picnic tables would be something relatively simple, but it is a big project because where they have to go is 4.5 miles down," Zollner said. The tables need to be flown down by helicopter, which increases the cost. The scouts have a goal to raise at least $1,000 to help with the project before they leave July 26. "It adds more meaning to [the trip]," said scout Sam Nearing, 14, of Wood Dale, about raising money for the benches he expects will give hikers a nice place to rest. Matthew McElroy, 13, of Wood Dale, said the troop has been learning how to work as a team while preparing for the challenge ahead. Boy Scout Troop 65 from Wood Dale, Ill., has been making the trip to the Canyon since 1967 every four or five years. This year, the Scouts added a fundraising mission: For every mile of their rim-to-rim-and-back hike, donors from Arizona to Illinois pledged money to be given to the Grand Canyon Association. Troop 65 originally planned to raise $1,000 for the construction and installation of new picnic tables at the Indian Garden campsite, a $33,000 project. On Tuesday, the Scouts emerged from the Canyon after a nine-day hike on the Bright Angel and North and South Kaibab Trails. Then they presented a check to the association for the amount they had actually raised: $4,500. "It was an unbelievable presentation," Scoutmaster Rich Zollner said Thursday as the troop returned to Phoenix to tour the Heard Museum before their trip home. "We also learned that we had an anonymous donor that will be matching the $4,500. We couldn't believe it." Zollner added that he believes friends and family from back home will continue to donate to the association's picnic-table project. Zollner, 67, said he has been on "more hikes than (he) could count" but said this one was particularly special. "It's my last hike," Zollner said, who spearheaded the fundraising efforts. "I teared up when I came out of the Canyon and found that my wife had flown out to surprise me. It was a very special moment." Peter Wedemann, a 16-year-old scout in Troop 65, saw the Grand Canyon for the first time when he arrived on July 26. "It was beyond words, phenomenal," Wedemann said. "It was all emotions." The best part of the trip for him wasn't even the sights, he said. "Presenting the fundraising money was special," Wedemann said. "It truly made me feel like a better person, connected to the Canyon." The Scouts, led by Zollner, all said they "got lucky" with the weather, which remained relatively cool during their hike. Members of Boy Scout Troop 65 carry a large American flag during the 2011 Wood Dale Memorial Day Parade. Scouts and their leaders from Wood Dale, Illinois, ride 250 miles by bicycle to spend the day on Mackinac Island as part of their annual High Adventure Trip Friday, August 7. Boy Scouts from Troop 65 include (pictured in no order) Colton Brandon, Greg Wagner, Jonathan Mercado, Tommy Fischer, Matthew Welmers, Daniel Ortiz, Michael Hansen, Phil Espinoza, and Josh Baehr. Leaders include Dan Wagner, Mike Rohl, Marty Welmers, Jim Hansen, Rich Zollner, Rick Fischer, Joaquin Mercado, and Terry Fults. Traveling 250 miles by bicycle, followed by a 20-minute ferry ride, nine Boy Scouts from Troop 65 out of Wood Dale, Illinois, reached Mackinac Island Friday, August 7. They were on their annual High Adventure Trip. By car, the scouts traveled from Chicago to Grand Rapids, where bicycles and helmets were unloaded from a support vehicle. Their trip plan was to cycle north along old converted railroad beds until they reached Mackinaw City. They camped in tents along the way, enjoying campfires and choosing campgrounds that offered evening activities. Eight adults accompanied the scouts. Scout Matthew Welmers, 17, who had never been to Mackinac Island, had the responsibility to decide on this year’s journey for the troop’s annual High Adventure Trip. After he found information on the Rails to Trails program and talked with his father, who had lived in Michigan as a youngster, he knew Michigan and a visit to the Island would be the perfect adventure. The troop was able to take advantage of the state’s trail program except for a stretch between Cadillac and Gaylord, where there is no pathway, so the troop found alternative roads to use. Rain made the beginning part of the trip difficult, agreed the scouts and leaders. Also parts of the trail grade were rocky and rough, and adding that to the wet weather made the early miles challenging. Patrol Leader Colton Senior, 14, said in the first two days the troop traveled about 56 miles a day. The trail was challenging, but then became smoother as the weather became more favorable. He has been to the Island before and likes the scenery. The difficult ride aside, the trip was not disappointing, said scout Jonathan Mercado, 13. A few years ago, said Scout Master Dan Wagner, the troop bicycled from Chicago to St. Louis, Missouri, on Route 66. Next year, the troop will take a break from biking adventures, he said, and will hike the Grand Canyon from rim to rim. For their return, the scouts will take a vehicle to Kalamazoo and take the train back to Chicago.